I had a fantastic day in the field last week: beautiful weather, great company and lots to see and learn. PhD student, Lisa Smallbone, took her supervisory team, Alison Matthews, John Morgan and I, to visit her field sites. Lisa is studying how birds use patches of native trees and shrubs that regenerate on retired agricultural land. For me a highlight was chatting about the complexities that emerge when we use chronosequences to study long-term ecosystem dynamics. Everyone wants to know how ecosystems will change in the future. Unfortunately, few of us live long enough to see the end result, so ecologists often cut to the chase by using chronosequences. The word ‘chrono’ is Greek for time (hence ‘chronology’). In a chronosequence, we select a series of sites that differ in age – some old, some middling, some young – and we compare attributes (such as structure, function or composition) between these sites to infer how ecosystems change as they gets older. Another name for this approach is ‘space-for-time substitution’. We’d prefer to document changes in selected sites over time, but we can’t wait that long, so instead we compare patterns across space, by sampling many sites at just one point in time. The assumption that underlies this approach is that the only thing that differs between sample sites is their age. All sites are assumed to have been the same initially, and to have experienced the same disturbances and conditions thereafter. This assumption is the Achilles heel of chronosequence studies. Old-growth Grey Box (Eucalyptus microcarpa) in a large patch of regrowth. Failing to meet this assumption has caused many ecologists to misinterpret the processes that underpin the patterns they observe, and has triggered lots of discussion about how chronosequences should be used in ecology (see two recent references in the list below). Obviously this assumption can never be met completely, as every patch of vegetation (like every person) differs for lots of reasons that have nothing to do with their age. One way to overcome the constraints of chronosequence studies is to regularly re-sample the chronosequence sites over time. This combines the best of ‘space-for-time substitution’ with actual measurements of changes over time. Meanwhile, until ecologists are granted eternal youth, we’ll continue to use chronosequences to assess long-term dynamics. We just need to remain alert to other factors that might contribute to differences between sampled patches. In our case, there are lots of good reasons why we’d like to know how natural ecosystems recover after damaging disturbances are removed – to understand how biodiversity patterns change as regrowth gets older. Rather than wait another 50 years, chronosequence studies enable us to predict how regrowth might change in the future, by comparing young and old patches that exist today. Lisa is documenting how ecosystem structure changes over time, and how birds respond to these structural changes. In future studies, we’re keen to see how ground plants and soil processes (such as infiltration, carbon storage, etc.) change as regrowth gets older. However, a few features of land use history in the region highlight the constraints of relying solely on chronosequences to answer these questions. For example, we might predict that remnant forests on public land will contain more old trees than patches of young regrowth. However, it’s not quite that simple. Forest patches may have more trees, but perhaps regrowth patches will contain trees that are older than those in forest patches. How might this happen? Remnant vegetation on an old road easement. The rush-like plant at the bottom left is the native Flax-lily, Dianella revoluta (photo by John Morgan). Many years ago, Andrew Bennett and colleagues found that roadsides and cleared paddocks in northern Victoria contained more large, old, hollow-bearing trees than remnant forests on public land, as big trees in forest patches had been felled for their timber. This quirk of land use history suggests that regrowth patches – all of which were once cleared paddocks – may end up having more (not less) large old trees than remnant forests. This raises an interesting, alternative hypothesis. Could regrowth patches that contain old trees, young trees and dense shrubs provide better habitat than remnant forests for organisms that require old trees? Let’s see what future results reveal. Similarly, it’s widely assumed that young patches of regrowth have low diversity of ground plants. But most regrowth patches in our study area were grazed rather than cropped originally, and many native plants are likely to have persisted in unimproved, grazed pastures. If so, then many species may not have to recolonize regrowth patches from adjacent areas. Instead, they may persist, perhaps at low densities, in young patches of regrowth. Again, future research will provide useful answers. Once again, forest patches on public land don’t provide perfect reference sites for comparison, as all forest patches have been grazed in the past. Indeed, roadside verges might provide some of the least grazed patches in the region. From our superficial observations, the native Flax-lily (Dianella revoluta) formed big patches on many roadsides but wasn’t obvious in regrowth patches. Perhaps this species will have to slowly recolonize regrowth patches. 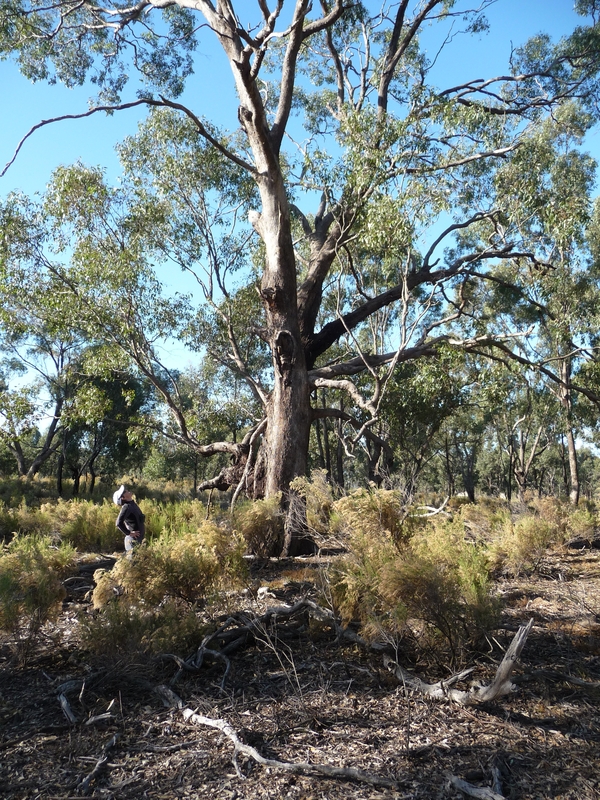 The chronosequence sites in central Victoria have lots to teach us about how natural ecosystems recover after human disturbances are removed. The patterns they show will undoubtedly trigger lots of new questions about the factors that influence natural regeneration and ecosystem recovery over long time periods. Time travel may not be possible, but traveling through space certainly is. So study a chronosequence for the trip of a lifetime. Bennett AF, Lumsden LF & Nicholls AO (1994) Tree hollows as a resource for wildlife in remnant woodlands: spatial and temporal patterns across the northern plains of Victoria, Australia. Pacific Conservation Biology 1, 222-235. Geddes L, Lunt ID, Smallbone L & Morgan JW (2011). Old field colonization by native trees and shrubs following land use change: could this be Victoria’s largest example of landscape recovery? Ecological Management and Restoration 12(1), 31-36. Johnson EA & & Miyanishi K (2008) Testing the assumptions of chronosequences in succession. Ecology Letters 11(5), 419-431. Walker LR, Wardle DA, Bardgett RD Clarkson BD (2010) The use of chronosequences in studies of ecological succession and soil development. Journal of Ecology 98(4), 725-736.